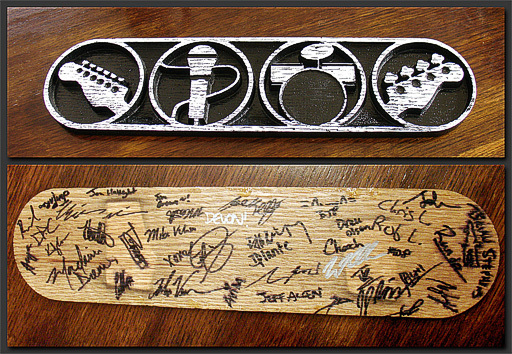 Here's the finished front and back of the Rock Band plaque. I don't have any particular Hero-worship concept behind getting dev-team autographs... I just like the concept that the hands that wraught the game I like also graced this object. I dunno. I like fetishizing objects. Also, I like givin' props to my old Ex-Ironlore peeps (noteworthy but not terribly readable in this picture: Chooch, Mike Verrette, Brian Parnell, Dan Chrislip, etc. etc). It's good to work on a game you're proud of.